When looking at the generator market, there is a wide range of options available to you. You have ones which are operated by gas as well as ones which operate off of electricity. There are compact generators and ones which are quite large. Some generators can last for a few hours, and other generators can last for days. Due to the large assortment of options, you need to know what your requirements are, especially when looking for the best inverter generator for RV. With an RV, it is always wise to have a generator available to you, so you don’t have to run a long extension cord from the RV. Or perhaps, you want the ability to run multiple things at once within the RV, and the RV doesn’t have enough juice in it. Having an inverted generator for camping is a great idea as well, so you have more options of where to take your RV during each trip. Within this article, we’re going to look at the top inverter generators for your RV on the market today, by reviewing details on three different inverter generators. We’ll list the features and benefits of each generator as well as a pro and con list for each of the three inverted generators. Let’s get started! 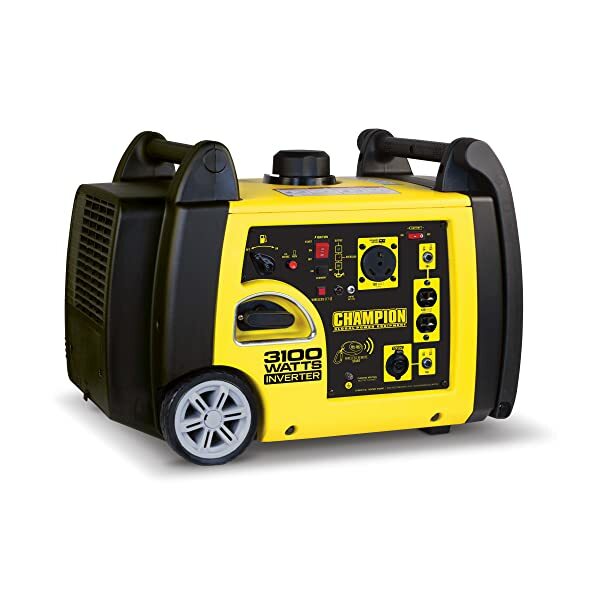 This Inverter Portable Generator from Champion comes with a Dual Fuel Component, allowing you to run it off of either Fuel or Propane. This dual fuel type feature means you are tied to only one kind of fuel, so you can use either when you are in a pinch. 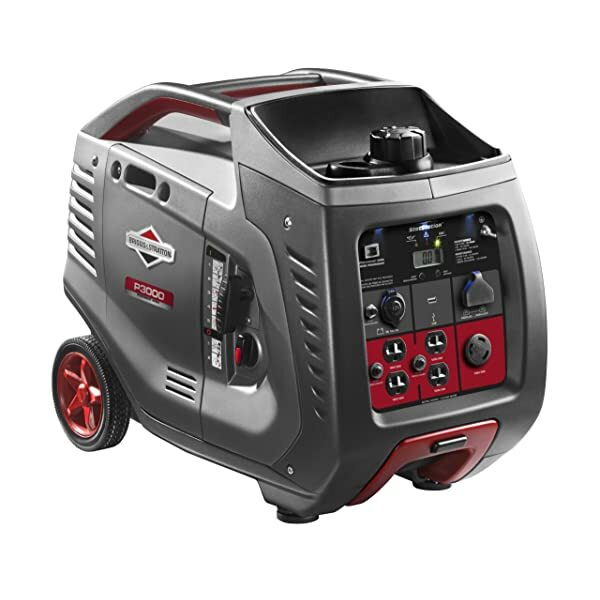 When this generator starts up, you will have up to 3,400 Watts of power, and while running it will produce between 2,790 and 3,100 Watts while running. Two wheels along a back of the unit for easy transport, along with a pull-out handle. 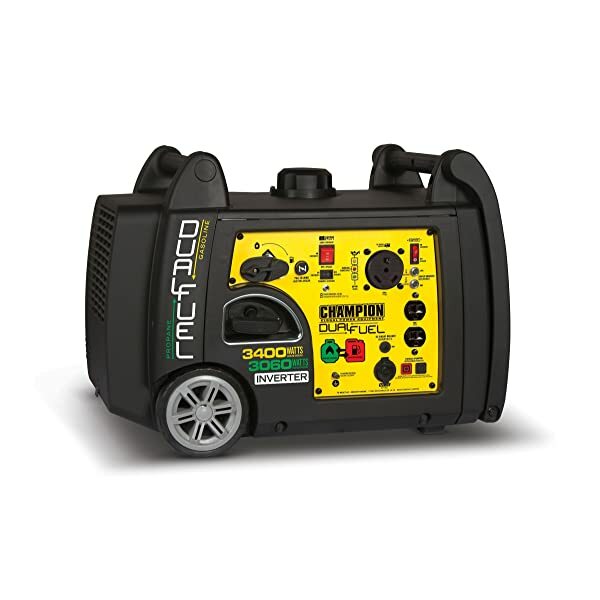 This Portable Inverter Generator from Champion comes with a remote start capability, which you only need to be within 80 feet to utilize. This feature allows you to position your generator wherever you want, and have an easy way to start it up. When this generator starts up, you will have 3,100 Watts of power, with 2,800 Watts of running power. This Inverter Generator from Briggs & Stratton operates off of gas and comes with an LCD display so you can see the necessary data to know how your generator is operating. Thru this display, you can monitor the power being used, the total number of hours the generator has been used in its lifetime, and easily tell what maintenance items need to be completed. Once you have compared all of the features and benefits of these three inverter generators, you might need a quick list of the best benefits and drawbacks of each one. Notable Features Easy to transport, with two wheels allowing you to easily drag it where you need it. This generator can operate by using either gas or propane. Easy to hook up to other Champion Generators. Has a Remote Starter, allowing you to start it from within 80 feet. Has a very low decidable level, only registering 58dba. Has an LCD display, giving you lots of information concerning this generator. Has a pull-out handle and wheels for easy transport. Can combine with other generators, but must buy a kit in order to do so. Clearly, each of these portable inverter generators have their own benefits, as well as drawbacks. Once you have decided which features are most important to you, it will be easy to determine the best generator for you and your needs. And once you have your portable inverter generator, you’ll feel safe and secure knowing you have the right generator each time you take your RV out for your next adventure.